This charming dwelling was so delightful to make and has such a peaceful look to it, we named it Tranquility cottage. The darling little fairy tale front of the house is one of my favorite styles. The house is mounted on a wooden base that fits neatly down into the top of a custom table. The battery and on off switch are mounted to the bottom of the base for easy access. The yard is landscaped with lots of shrubbery and trailing vines. 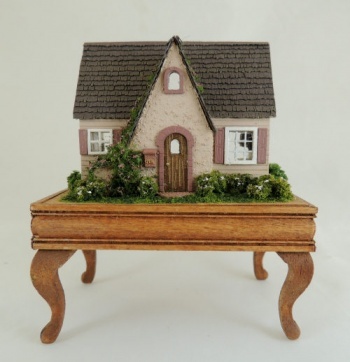 Whether you are looking for a dollhouse for your 1/12 house, or just love to work in the smaller scales, you will love this project. Furniture is made with my new material, which means that it is very very fine, but virtually unbreakable. AND, the brown furnishings need NO painting!! It can't get much easier! There will be an extensive online tutorial for this project, which is scheduled to ship mid April. Kits are limited and available on a first come, first served basis. If you have any other questions, drop me an email!